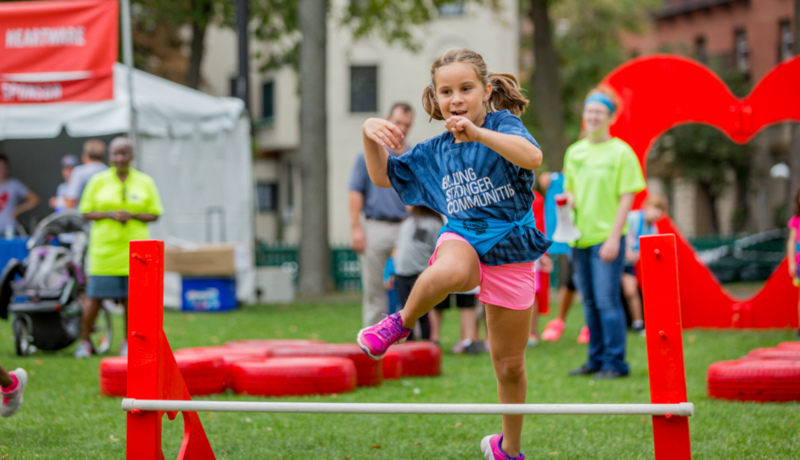 This year’s Boston Heart Walk will feature the Kids Heart Challenge, an obstacle course for children ages 5-12. If the odds for winning the lottery were 1-3, you might be inclined to play. In a different scenario with the same odds, you wouldn’t want to take the chance. That scenario is heart disease and stroke, America’s No. 1 and No. 5 killers. According to the American Heart Association, cardiovascular disease is the underlying cause of death in approximately one out of three deaths in the U.S. each year. However, changing the odds to save lives requires money. The Boston Heart Walk, the American Heart Association’s premier fundraising event in Greater Boston, helps fund cardiovascular research and education. About 10,000 are expected to participate in the walk on Saturday, Sept. 9 – many of them heart disease and stroke survivors. 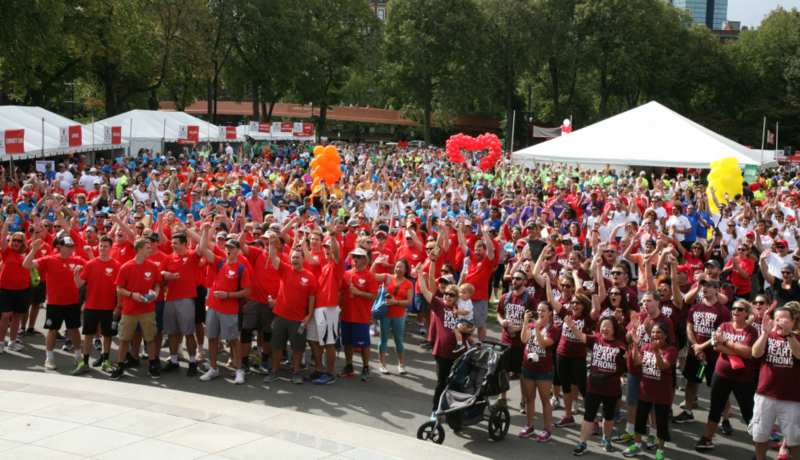 Nearly 10,000 walkers flooded the DCR Hatch Shell along the Charles River Esplanade for the 2016 Boston Heart Walk. This year’s walk will be held on Saturday, Sept. 9, at the same location. Among the survivors and 2017 Boston Heart Walk participants is Christopher Sadler, who experienced heart failure when he was 17. His story shows the harsh reality that cardiovascular disease can affect anyone at any age. On Oct. 5, 2007, Christopher carpooled to school with friends. They parked in the lot farthest away from school, which meant walking across a large field to reach the doors. “When we got to the end of the field, I suddenly felt a sensation that I had never felt before in my life,” Christopher says. “It felt like I was fading in and out of consciousness.” When the tunnel vision began, he knew something was wrong. He thought he was in the Twilight Zone. Christopher went to the nurse’s office and explained his symptoms. “My pulse was barely existent, and my heart rate was reading at about 200 beats per minute,” he says. “By the look in [the nurse’s] eyes, I could tell that this was something very serious.” He was rushed by ambulance to South Shore Hospital’s emergency room, but doctors there realized his condition was too severe for them to treat. He was transferred to Boston Children’s Hospital. Christopher needed a second surgery to install a pacemaker/defibrillator (ICD) device in his heart. Once he was on his feet, he walked past a baby named Jackson who was in the next room. He, too, was suffering from heart failure. “Seeing Jackson in the same position I was in made me think about my life and how grateful I am for everything,” he says. Christopher Sadler is raising money for the Boston Heart Walk for the first time this year after having emergency heart surgery in 2007. 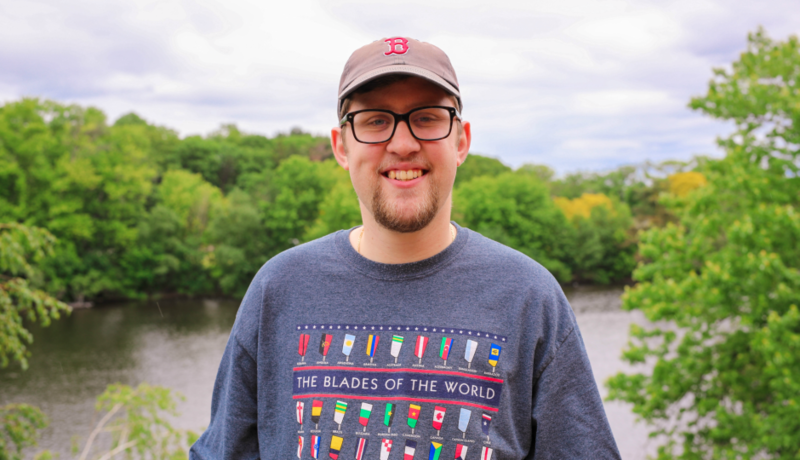 To celebrate his 10-year heart anniversary, Christopher created “Team Chris” that will participate in the Boston Heart Walk. “I feel strongly that if we bind together, we can be the loud voice that blows the cover of the silent killer,” he says. A walker celebrates finishing the 2016 Boston Heart Walk. 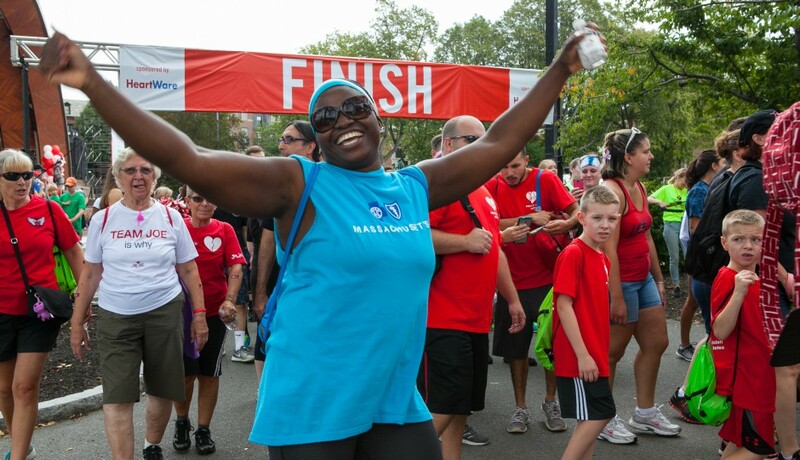 This year’s Boston Heart Walk features 1, 3 and 6-mile courses. Walkers get to choose their course on the morning of the walk. All routes are stroller and handicap accessible, as well as open to pets. Jeanne Curley’s story is, perhaps, more common. For years, she felt tired and experienced frequent heartburn. These common symptoms of heart disease were often misdiagnosed. When Jeanne was 38, doctors accurately diagnosed her serious condition: dilated cardiomyopathy. This causes the heart to enlarge and significantly reduces its ability to pump blood. The leading reason for heart transplantation, cardiomyopathy results in heart failure. “I am fortunate to have a wonderful cardiac team at Brigham and Women’s who have effectively utilized medications to stabilize my condition, and I am beginning to show signs of improved heart function,” she says. She hopes to never need a heart transplant. 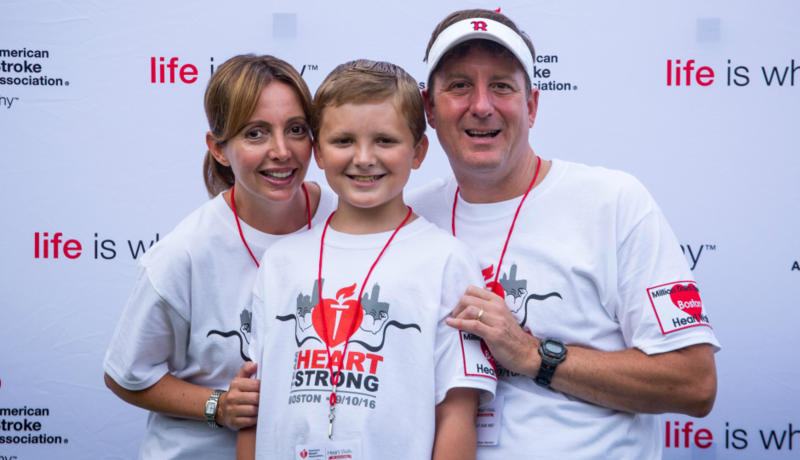 Jeannie and Brian Curley, pictured with their son Devin, are two of top fundraisers for the Boston Heart Walk’s Community Teams. When Jeanne was 38, she was diagnosed with a serious heart condition that caused her heart to enlarge and reduced its ability to pump blood. While the exact cause of cardiomyopathy is not understood, it is likely a hereditary condition. Jeanne’s son, Devin, has a 40 percent greater risk of developing the disease because of her diagnosis, so he undergoes annual exams to ensure early detection. “I am hopeful that with continued research the causes of cardiomyopathy will be better understood, and improved treatments can be developed,” she says. Like Christopher, Jeanne and her husband, Brian, are committed to the efforts of the American Heart Association to combat heart disease and stroke. “It started as a goal, which led us to a community, which has become a passion,” Brian says. 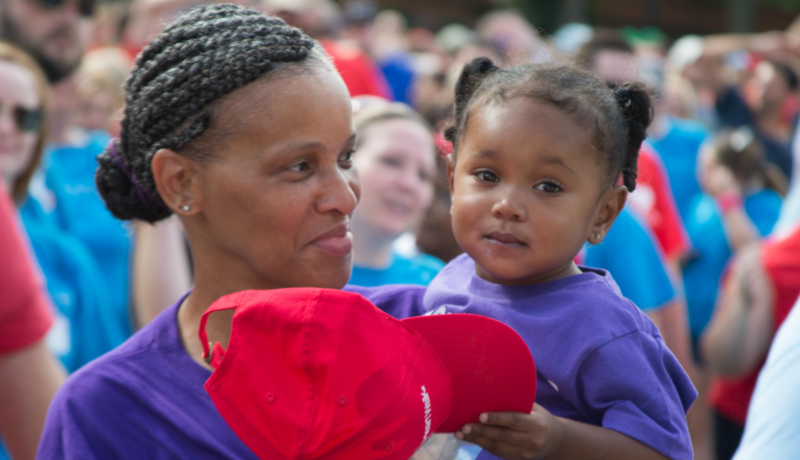 A mother and daughter share a moment at the 2016 Boston Heart Walk. The walk is open to families and children of all ages. 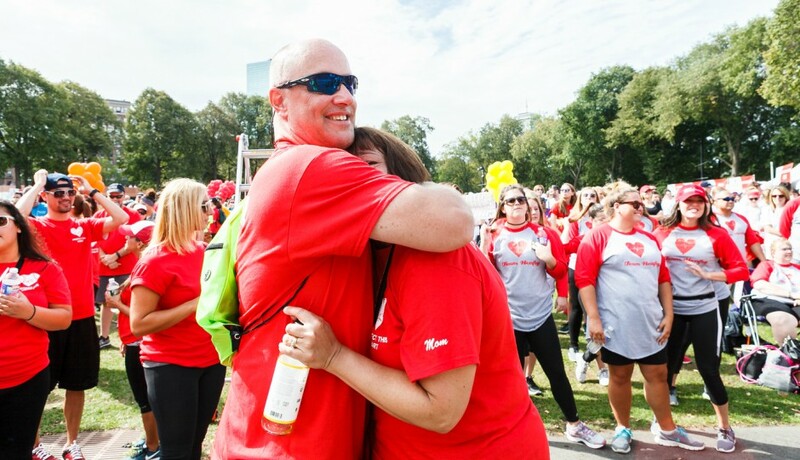 Two walkers embrace at the 2016 Boston Heart Walk. The battle against heart disease and stroke is going to be lengthy, but supporting the efforts of the American Heart Association will help tremendously. Participating in the Boston Heart Walk as a walker and/or fundraiser is a great way to help fund additional research and educate people about how they can take care of their health and better the odds. For more information about the American Heart Association, visit heart.org.